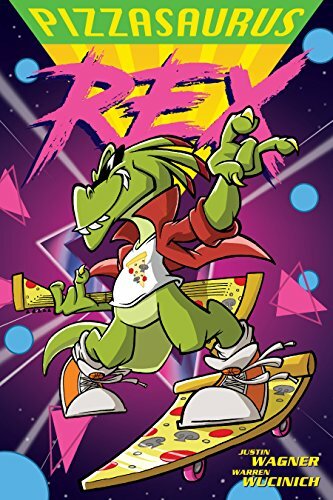 Pizzasaurus Rex is a rather bizarre comic that’s a mashup of Bill and Ted’s Excellent Adventure, Dumb and Dumber, and Napoleon Dynamite, channels George Carlin, Matthew Broderick, Bill Murray, and Michael Keaton, among others. It’s a fluff piece without much depth – think of it as a popcorn flick or a Saturday morning cartoon for middle-schoolers – but it has a crazy energy and a smidgen of horror. I can’t even begin to describe the journey of Jeremy Duderman, except he’s a throwback to the 90’s and everything bad ever said about nerds. Add in classic bullies, a pizza-munching dinosaur, and another dimension, and well, you have the basis for the story. I think that middleschoolers who like Artemis Fowl and similar books where there’s a bit a crude humor, name-calling, and a lot of attitude will enjoy this. The life lessons are a bit light, but they’re there if you dig hard enough. But there’s plenty of punching and decapitating action. This might be a comic that will encourage kids to read while not really being that thought-provoking, just mindless silliness. And sometimes that’s not a bad thing! I’m only giving it four stars because there didn’t seem to be any really solution for the name-calling and bullying, the sexism toward the female characters, and the general disrespect for academics and intellectuals. It’s as if some of the bullying was justified. It’s just something that was really hard to quantify as ever truly addressed by the story.